Portland, Oregon, is considering Measure 26-201 which, if adopted, would create a 1 percent gross receipts tax within the city limit. The tax would apply to retailers with more than $1 billion in national sales and $500,000 in Portland-specific sales. It would also include large service-based firms, including retail banking services. The tax as currently proposed, however, functions more closely to a sales tax, something that Oregon residents have traditionally opposed. While large companies will bear the legal incidence of the tax, the economic incidence of the tax will be felt by Portland residents. The tax would result in higher prices for consumers and fewer job opportunities for residents. If adopted, the tax would actually decrease Oregon’s state tax collections. The Portland Clean Energy Community Benefits Initiative, or Measure 26-201, will appear on the November 2018 ballot within the city of Portland, Oregon. This tax is the latest iteration of a gross receipts tax in Oregon, following debates in both 2016 and 2017 to create this type of tax. If adopted, the initiative would create a 1 percent gross receipts tax on retail sales and dedicate the proceeds towards clean energy projects. However, as designed, the tax functions less as a gross receipts tax and more as a sales tax. The tax would raise prices for consumers in the city of Portland and limit their employment opportunities. It would also reduce the size of Oregon’s state budget, by reducing state tax collections. Local Measure 26-201 would create a tax that would be assessed at a rate of 1 percent on final “retail sales” of large merchants. Retailers with more than $1 billion in national sales and $500,000 in Portland sales would be charged the tax. The tax would be collected starting January 1, 2019. The proposal would exempt several types of products, including “basic groceries, medicines, and health care services.” The proposal defines “groceries” as items available for purchase using Supplemental Nutritional Assistance Program benefits and “medicines” as drugs regulated by the Food and Drug Administration. Health care services includes “service that involves the provision of health care to the public, including but not limited to doctor, medical clinic and hospital visits and all related services, health insurance, and any care provided by senior care facilities or rehabilitation facilities.” This seems to be a reaction to the previous 2016 debate to create a statewide gross receipts tax, where much of the messaging focused on the tax’s impact on groceries and gasoline. The new tax would apply to not only goods transactions, but also retail service transactions. The proposal doesn’t specifically define what it means by the retail sale of services, raising significant questions as to which services would be included. However, it does specifically enumerate “retail banking services” as being included. Individuals’ banking activities, such as maintaining bank deposits and using Automated Teller Machines (ATMs), could be activities subject to taxation. Gross receipts taxes are an antiquated style of tax, dating to the 13th century. These taxes are assessed at each level of production. The tax builds upon itself as goods (or services) change hands. By the time the good reaches the final consumer, the tax has been imposed multiple times, including on previous taxes paid. 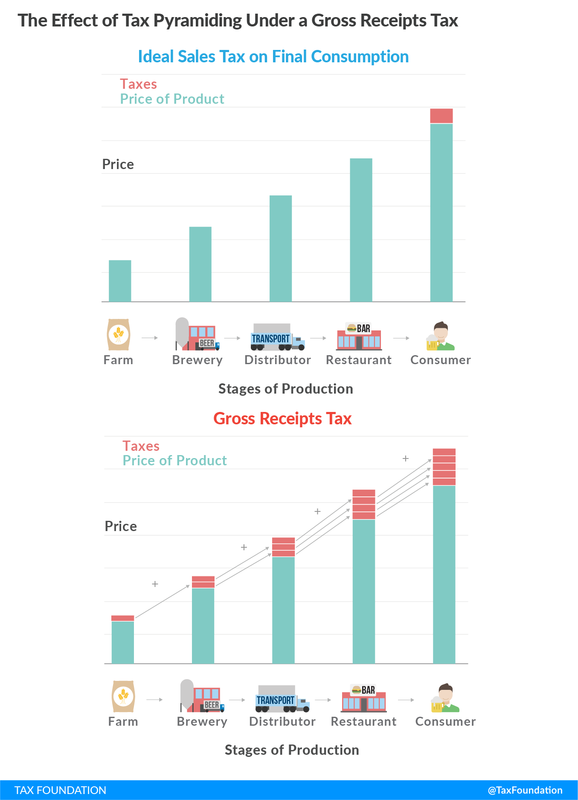 Figure 1 illustrates how a gross receipts tax works. This approach differs from general sales taxes where only the final transaction is taxed. Sales taxes have this structure for a number of reasons. First, it mitigates the pyramiding under a gross receipts tax. Second, by taxing all final consumption, sales taxes distribute the tax burden “in order to conform as closely as possible with accepted standards of equity.” All consumers are impacted, but at a much lower rate than if the tax were levied on specific products. Figure 1 (above) also illustrates a hypothetical sales tax, which only taxes the final consumer. State sales taxes, however, fall short of being ideal in many cases. State sales taxes do not tax final consumer services, such as landscaping, dry cleaning, and cosmetology services, on a broad basis. Rather, states pick and choose which services to include in their sales tax base. A survey by the Federation of Tax Administration found that only six states tax “barber shop and beauty parlor” services, while only 20 tax dry cleaning services. States also often exempt a number of goods from the tax to limit the regressivity of the tax. Only seven states include groceries in their sales tax base, while only one taxes prescription drugs. Combining the broad exemptions for both goods and services means that the median state sales tax base only taxes 23 percent of personal income. Additionally, most state sales taxes actually include significant amounts of intermediate transactions. For example, of the 45 states with general sales taxes, eight tax manufacturing machinery in their sales tax base. Forty-two states include business leases and rentals in their base. Some estimates are as high as 42 percent of sales tax collections are from business inputs. State sales taxes, therefore, exist on a spectrum with gross receipts taxes. Some state sales taxes, such as those in Hawaii and New Mexico, include significant pyramiding and are sometimes considered to be closer to a gross receipts tax. In other cases, states call their sales taxes “gross receipts taxes,” as is the case in Arkansas, but they are economically closer to sales taxes. Simply calling something a “gross receipts tax” or a “sales tax” does not make it so. As noted above, state sales taxes and state gross receipts taxes can share many characteristics. 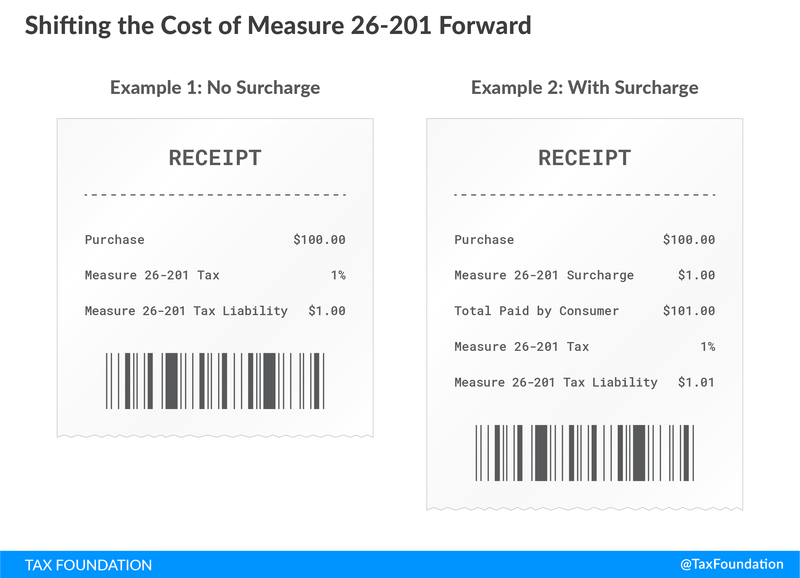 When evaluating Measure 26-201 in this framework it becomes clear that while the initiative is described as a gross receipts tax, it is really in many ways a well-designed sales tax. First, because it only applies on final transactions, the tax pyramiding is limited. The tax only applies on “gross revenues from retail sales in Portland,” meaning that in most cases only the final consumer’s transaction will be subject to the tax. Additionally, this proposal would exempt several broad categories of transactions that are traditionally exempted by state sales taxes to limit the perceived regressivity of the tax. The tax’s design is ironic given the overwhelming opposition to sales taxes in Oregon. Voters in the state have voted nine times in statewide elections to oppose the creation of a sales tax. This opposition has limited the ability of the state to diversify its revenue streams and spurred its consideration of gross receipts taxes both in 2016 and 2017. While not intentioned, adopting Measure 26-201 would create a functional sales tax in Oregon. Measure 26-201 would impact Portland residents. While the tax is described as a “surcharge” on a company’s “gross revenues,” the economic burden of the tax will surely reside with the residents of the city. Firms will look to shift the burden of the tax either forward to their consumers or backward to their workforce. First, the tax, if adopted, would likely raise prices for consumers in the city. This is the easiest way to pass the tax along. By raising prices, firms limit the impact of the tax on their bottom line. The impact could also manifest differently in Oregon than it would in other states. Oregon does not have a prohibition on listing a gross receipts tax on a consumer’s receipt. This is different than in other states, such as Washington, which strictly prohibits listing the state’s gross receipts tax on a receipt. Listing the tax would allow the firm to pass the tax along to the consumer, but doing so would actually increase the amount of their total revenues, as the surcharge would be considered part of their gross receipts. However, their share of the tax liability would decrease. In the case of financial institutions, the one service industry specifically enumerated in the proposal, banks might be less willing to provide low-margin banking services, such as checking account or ATM withdrawals with no minimum requirements. Instead, financial institutions could look for ways to pass the tax burden along to their customers. Imagine a retailer decided to assess a surcharge on its customer’s receipt. The retailer increased its tax liability from $1.00 to $1.01, but now $1 is directly paid by the consumer. The bank was able to significantly reduce its tax liability by shifting it visibly forward. It’s also possible that firms will decide that they are unable to shift the cost forward. If the firm is in a competitive price market, it could conclude that higher prices would result in fewer customers. In that case, it will instead look to shift the tax elsewhere. It could consider hiring fewer workers, providing fewer hours or benefits to its employees, or it might limit its expansion. Given the tax only applies within Portland, it is quite possible that firms will instead look to move outside of the city borders to limit the tax’s impact on the firm. Measure 26-201 is a Portland, Oregon, specific initiative, but its adoption could also impact Oregon’s state budget. Federal law allows individuals and C corporations to deduct their state and local taxes from their income tax returns. Oregon, through its conformity to the federal tax code, allows that same deduction, meaning that the assorted taxes levied by Oregon localities, such as Portland, are deductible from a C corporation’s state income taxes. That means the firms that are subject to the Measure 26-201 clean energy tax would be able to deduct the cost from their state corporate income tax. It would lower the amount of revenue collected by the state of Oregon. Assuming the payers of this tax are in the highest Oregon corporate income tax bracket, the tax would reduce Oregon revenue by more than $2 million. While that amount is small relative to Oregon’s total general fund budget, it would still reduce total tax collections. The debate of creating a new gross receipts tax in Oregon continues, this time with Measure 26-201. If adopted by Portland residents, the proposal would create a 1 percent surcharge on large retailers’ gross receipts. However, contrary to the stated intentions of proponents, this tax would instead create a functional sales tax in the city. The tax would result in higher prices for consumers, fewer job opportunities for employees, and a decreased size of Oregon’s state budget. Multnomah County, State of Oregon, “Full Text of Ballot Titles—November 6, 2018,” https://multco.us/file/75008/download. Portland Clean Energy Community Benefits Initiative 2018, Section 2, 2. https://static1.squarespace.com/static/5b847fe4f8370ad8f30a8cac/t/5ba29cbb8985834b3fc96aec/1537383612767/Portland+Clean++Energy+Community+Benefits+Initiative+2018++%2818-02-20%29+.pdf. Portland Clean Energy Community Benefits Initiative 2018. Portland Clean Energy Community Benefits Initiative 2018, Section 2, 2. Portland Clean Energy Community Benefits Initiative 2018, Section 3, 16. Scott Drenkard, “The Texas Margin Tax: A Failed Experiment,” Tax Foundation, Jan. 14, 2015, https://taxfoundation.org/texas-margin-tax-failed-experiment/. Professor John F. Due and Professor John L. Mikesell, Sales Taxation: State and Local Structure and Administration (Baltimore: The John Hopkins University Press, 1983), 23-24. Nicole Kaeding, “Sales Tax Base Broadening: Right-Sizing a State Sales Tax,” Tax Foundation, Oct. 24, 2017, https://taxfoundation.org/sales-tax-base-broadening/. This is largely due to historical accident. The first state sales tax dates to 1930 in Mississippi. It was designed to only apply to tangible products. This model was copied over to the other states as they adopted Mississippi’s tax design. Federation of Tax Administrators, “2017 Services Taxation Survey,” https://www.taxadmin.org/sales-taxation-of-services. Jared Walczak, Scott Drenkard, and Joseph Bishop-Henchman, “2019 State Business Tax Climate Index,” Tax Foundation, Sept. 26, 2018, Table 17, https://taxfoundation.org/state-business-tax-climate-index-2019/. Jared Walczak, Scott Drenkard, and Joseph Bishop-Henchman, “2019 State Business Tax Climate Index,” Table 16. COST and EY, “Total State and Local Business Taxes: State-by-state estimates for fiscal year 2016,” August 2017, 4, https://www.ey.com/Publication/vwLUAssets/ey-total-state-and-local-business-taxes-2016/$File/ey-total-state-and-local-business-taxes-2016.pdf. Hillary Borrud and Chris Lehman, “Oregon’s history of rejecting tax reform and spending limits opened door for Measure 97,” The Oregonian, Oct. 28, 2016, https://www.oregonlive.com/politics/index.ssf/2016/10/oregons_battle_over_measure_97.html. Anna Marum, “Sen. Mark Hass blasts corporate tax attack ads as ‘amateur,’ ‘lazy,’” The Oregonian, Apr. 8, 2017, https://www.oregonlive.com/politics/index.ssf/2017/04/sen_mark_hass_blasts_corporate.html. Nicole Kaeding, “Oregon’s Gross Receipts Tax Proposal Would Increase Consumer Prices,” Tax Foundation, July 18, 2016, https://taxfoundation.org/oregons-gross-receipts-tax-proposal-would-increase-consumer-prices. Nicole Kaeding, “Shifting the Cost of Measure 97 Forward,” Tax Foundation, Oct. 17, 2016, https://taxfoundation.org/shifting-cost-measure-97-forward/. Nicole Kaeding, “Yes, Really. Measure 97 Would Raise Prices,” Tax Foundation, July 28, 2016, https://taxfoundation.org/yes-really-initiative-petition-28-would-raise-prices/. Individuals, per the Tax Cuts and Jobs Act, are limited to a $10,000 deduction, but C corporations have an uncapped deduction. State taxes are removed from the calculation, otherwise state taxes would be deductible from state taxes. This is calculated by deducting $30 million, the estimated new revenue, from Oregon’s highest corporate income tax rate of 7.6 percent. Nicole Kaeding is Vice President of Federal and Special Projects at the Tax Foundation. 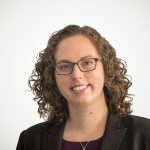 Previously, Nicole was a budget analyst for the Cato Institute focused on federal and state fiscal policy, and the state policy manager for Americans for Prosperity Foundation where she oversaw the policy activities of AFPF’s 34 state chapters.